I am a jewelry artist by trade, and so I am always investigating interesting elements to add to my jewelry designs. For the last year, I have been scouting the treasures on Ebay for vintage charms to add to jewelry--necklaces, bracelets and earrings. Sometimes I combine the vintage charms with my own creations to get a completely unique piece of jewelry. For a romantic gift, there isn't a symbol more telling than the heart charm. And heart charms have been romantic symbols for a long time, making it one of the easiest vintage charms to find. Hearts carry a lot of meaning, yet can be appropriate for a teenager or an adult in a romantic setting. Even by themselves, vintage heart charms make very simple, yet evocative necklaces just on a silver chain or leather cord. When a heart charm is vintage, you also get the history of love behind the piece. To see more charms in any category, just click through any of the links provided on this page. I don't really understand why, but puffy heart charms have been very popular over the years, and the puffy style is one of the easiest to find as a vintage sterling silver heart charm. They do come in varying sizes, and are quite lightweight due to the hollow center. Puffy heart charms often have carving, etching, inlaid stones, or are molded with embossed designs to add more interest to the outside shell. One of my personal favorite design techniques that was quite popular in vintage times is the filigree. It is such a delicate scrolling either within or on the surface of a heart charm. You can find puffy heart charms completely made of filigree or others with just a touch of filigree on the surface. It is not surprising that many vintage heart charms have floral designs, and one of the most common is the Forget Me Not flower. Since a heart charm is given as a keepsake or remembrance, you better not forget the giver. Seriously, some of the most stunning vintage designs are the floral motifs, and some hearts even say "Forget me not" right on the surface of the charm. 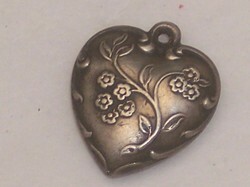 Floral designs are sometimes carved into the surface of the heart charm, but more often are in relief on the surface. The designs in relief in most cases are better made and contain a greater amount of silver, since the relief is added to the silver base of the charm. Lockets have always carried a special meaning to them, as they are meant to carry a piece of your loved one with you. During Victorian times, lockets were worn by men and women in different pieces of jewelry, and would carry usually a lock of hair or small portrait. Lockets are still popular today, although not quite as predominant of a jewelry design as during the Victorian era, yet many women cherish the locket that they received as a child or young woman. Vintage lockets are often added to new jewelry designs due to their added value as a piece of memorabilia as well as design. Some of my favorite vintage sterling silver heart charms are the ones that have either inlaid enamel in a cloisonne technique or have an enameled design over the entire surface of the heart. Enameling is a very difficult and time consuming process when done by hand, and many of the heart charms are not more than 1/2 inch in diameter. This means that a lot of time was spent applying the enamel by hand. Enamel lends the vibrant colors of glass to the cool metal color of silver, and gives a vintage heart charm an entire new look.